I’ve begun to wind down a little in preparation for the Atacama Crossing, though I’ve managed to cram in a few extra miles this week. On Tuesday I walked back from work wearing a heavy backpack of about 15kg’s, calling in at the Altitude Centre at Metis and did an hour on the treadmill, same format as last week’s session. It was another supervised session with the instructor. I ran for 5 minutes with the mask on, warming up, then a further 15 minutes before running for 5 minutes with the mask off. Whilst wearing the mask, my oxygen sats plunge to about 80% and my heart rate goes up 20 beats per minute more than without it; around 136 – 140 bpm. After the 5 minutes without the mask, it goes back on for 15, off for 5, back on the 15 then off for the last 5-10 minute cool-down. Here is what the output graph looks like. 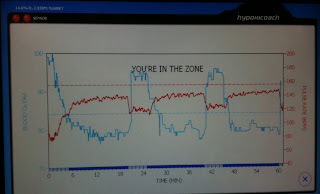 Red line is my pulse, the blue line is my oxygen sats. You can clearly see the 15/5 min intervals. On Wednesday morning, I again loaded my backpack up with 15kgs of weight and walked into work. At lunchtime I did my weekly speed session. This week I ran for 18 minutes at 14.2kph. Usually I’d increase it at the 15 minute mark, but I’ve been trying to get it up to running a steady 14.5kph for the whole 20 minutes. After 18 minutes I was really feeling the pace, probably as a result of doing the 25 mile Anglezarke event a few days earlier, and a 12 miler two nights before. I turned it down to 14kph for 45 seconds, for a brief breather, then overcompensated the last minute and cranked it back up to 15kph for the last minute or so. When 20 minutes had gone by, I had done 4.73kph, only a minor improvement on last week, and still 90 metres off my target of 4.83kph (3 miles) in 20 minutes. It’s definitely getting hard now; harder than I thought. I guess I have increased my average running speed by about 1kph in the last month which is quite a lot. I’m due to do another session later. I’m unsure whether I should increase the overall average speed up to 14.3 or 14.4, or just leave it at 14.2 and then try and blast out the last few minutes at around 15-16kph (if I can!) to try and reach the overall average of 14.5kph. I think I’ll just see how I feel in a few hours. I have two chances left; today and next Tuesday. I’m only a few seconds off my target, so I guess it doesn’t make a massive difference but I’m going to give it a shot anyway. EDIT: Just did my speed session at lunchtime. Another improvement but still some way to go I think. I ran for 14 minutes at 14.2, then flipped between 14.2 - 14.6 for the next 4 minutes. In the last minute I set it to 15+, and the last 30 at 16.4kph. I was running as quick as I could manage, but the clock stopped at 20 minutes - distance travelled 4.77km - 50 metres off. I would need another 10 seconds to do 4.82km. So near yet so far! It's probably unrealistic to expect me to be able to make than gain in just a week. I am clearly approaching my physical (VO2) capability. I say this becuase, this would make my 1.5 mile time at around 9:25 seconds (that's an approximation), my age is 36. Using some of the VO2 estimation calculators that would put my VO2 max at 54-55ml/kg/min. Now, in 2006, just as I was starting running seriously, doing my first 3 mile runs etc, I had my VO2 max measured at a local university, as I was in my untrained state. It came out at about 45 if I recall correctly. Now, I understand that you can only ever "train" your birth bestowed VO2 max up by 20%, which would give me 9% more to play with and hence hits that 54 VO2 max perfectly. So, I think I am getting close to my genetic limits, and there's not a lot I can do about that! I think I could still get that sub 20 3 mile, but it may take a few more weeks to eek it out. Still that's 6:43 minute miles, which is about 10 seconds per mile (30 seconds quicker overall) faster than I have ever been fit enough to do it before. We'll have to see if I can summon up enough strength to have another go next week, or just stick to plan and taper properly. Not decided yet. The good news is that for an endurance athelete, and the speeds we run at, VO2 max doesn't have a great deal of bearing. It's just a number. It matters for the guys going faster than me! Anyway, back to this weeks news. After work I walked back with my heavy pack again, once more calling in at Metis and doing another altitude hour on the treadmill, same as before. This time the session was unsupervised, as I had been taught how to use the machines. I completed the session with no problems and continued my walk back with my pack. I got up early on Thursday, walked into work with my 15kg pack, via Metis again, arriving as it opened, and did yet another altitude hour unsupervised on the treadmill. So, by this stage I have covered 26 miles running or walking this week, more than I intended at this stage. I had planned to do a 15 mile run on Sunday but that would have taken me way over my 30 mile target, and besides I had made other plans. I went home on Thursday night, worked from home on Friday morning and then caught the Eurostar, taking my 5 year old boy to Disneyland Paris for the weekend. This was much needed I think. I found a big knot of bunched muscle in my left calf. I have been ignoring it I think, and it had almost got to the point of being chronically tight. I have a reoccurring problem with this one calf muscle. I think another 15 miles would have tipped it over the edge. I self massage it for an hour on Thursday night, and continued to stretch it at every opportunity over the weekend, in between Peter Pans Flight, and It’s a Small World rides! We came home on Sunday night after a great weekend. I did however feel sufficiently guilt ridden and had my usual fear of loss of fitness that I played catch up and ran 10 miles on Monday night, on a hilly trail route. It was pitch dark and in the snow and ice. I kicked block of ice on a descent and took a tumble, sliding on the painfully hard ice on the ground. Luckily I just picked up some bruises and cuts. So, in the end I covered 36 miles in total last week. This week, I suspect it’ll be fairly similar, maybe even a little more, as I have four planned altitude sessions, each one I do about 5 miles, plus the walking to and from work every day wearing the heavy pack(about 3 miles each way – the direct short route), and a long run at the weekend. So, I guess I’m not really tapering a great deal, but I know my body well enough to know that I don’t really need to. I’ve cut down sufficiently to allow some recovery, and I’ll certainly ease right back next week. I hadn’t planned to do anything, but I will more than likely do 3 altitude sessions, even if the last one is just sitting down wearing the mask, the day I fly out to Chile (next Thursday evening). My mental approach is improving, really just down to the comforting thought that I have done so much training. I did a little analysis of the finishing times for each of the stages last year, and I am still going to try and target the middle of the field stage finish times. I only included people that finished the whole event overall. So, the approx finish times for those that finished in the middle of the pack were. Stage 2 and 3: 7 hours 45. Stage 6: about at hour for the 10k stage. There is one curveball this year. It’s going to be hotter than last year, because the race is a month earlier (hotter season), so the stage times are bound to be somewhat slower this time. I’d much rather finish in a reasonable time each day that taking 10 or 11 hours to do each of the shorter stages, as some people do. More time out is less time at camp recovering. One last post next week before I fly out for the event. Have a good week! Sounds like your prparation is going very well. Hi Rich, glad you had a good time in Disneyland Paris with your lad. Sounds as though you are well prepared for the Atacama, can't believe how quickly it's come around! Thanks both. Yes prep has gone very well. Just need to survive the next week in one piece. Disney was a nice break for us both. It has come around fast hasn't it? I'm as fit as I can possibly be right now, so I've no excuses, and I won't get sick this time! If I try and think compete rather than complete it will hopefully put me in the right mindset. That's not to say i'll be anywhere even approaching the front of the field of course, I'm not that gifted, but if I have to believe I can do well, and not just hang on for a finish!